Why didn't Disengagement from Gaza work? As the war in Gaza moves to the conclusion of its fifth day... as thousands of Kassam rockets, as well as Katyusha and Grad rockets, have rained down on Israel since the 2005 disengagement... as the government of Gaza continues to refuse to recognize Israel (as anything other than a target)... I think it's fair to say that Ariel Sharon's Disengagement plan failed. Why did it fail? Here's a column I published in the Allentown Morning Call in 2005, when Disengagement was just a plan on the drawing board. I didn't assume that anyone's intentions were evil. I didn't talk about the horror of evicting thousands of families from their homes. I credited the Palestinians for everything they claimed to be doing, whether I could verify that it was true or not. In short, I tried to judge the Disengagement plan not from the perspective of a Jew, but from an independent perspective, as though I were the mythical creature known as the unbiased European. Disengagement went 0 for 3, and we can see the results for ourselves. Albert Einstein is reputed to have defined Insanity as doing the same thing multiple times but expecting different results. So, I must ask: Does the current round of the Israel-Arab peace process, as a repeat of 1990s' Oslo peace process, fit Einstein's criterion? None of these components was present for Oslo. Yasser Arafat frequently declared that peace would only be a stepping-stone to a Greater Palestine. There was no democratic approval; Israeli citizens were never permitted to vote on any of their government's offers of land and money, and Palestinian Arabs never voted to approve any changes in their national approach toward Israel. The international community certainly was not impartial; European governments, left-wing Americans and the United Nations perennially insisted that the entire fault for the crisis lay with Israel. The result was seven years of falsely raised hopes, and the past four years of bloody war in Israel. Thousands have been killed, the price of a sloppily arranged ''peace coup.'' Have things changed, or are we madly pursuing the path of ruin again? There is evidence to support a sunny view. There are signs of a cooperative government on the Palestinian Arab side. Palestinian Prime Minister Mahmoud Abbas has made concrete moves in the right direction, such as reducing the anti-Israel venom on Palestinian airwaves, and cutting back financial support of terrorist groups. Israel's government also seems bent on proceeding. It has committed to withdraw from land it viewed in the past as needed for security, and it is refraining from responding to terrorist attacks with military force. We are a long away from democratic approval on either side, though. True, the process has been more open and transparent than Oslo — which was negotatiated out of the public eye by Shimon Peres and Palestinian Arabs — but neither population has been democratically consulted. Polls continue to show that the majority of Palestinian Arabs are not committed to any process unless they receive certain demands that Israel has already declared to be off the table — such as resettlement of the extended families of every Arab who ever lived in Israel before 1948. On the Israeli side, the government has refused to allow a national referendum on whether to transfer Israeli families out of their homes in Gaza. The implications of this move are enormous. Israelis do not have the option of remaining in their homes, so that Gaza will be the only place in the world that is fully judenrein, Jew-free. We wouldn't tolerate that in America, we would file angry protests if it were in Europe, we would rage at it in Saudi Arabia, but Israel is about to engineer this situation itself, willingly, without allowing its population to vote; the needed democratic element isn't there yet. For the third pillar, the international community, led by the United Nations, is still not involved in an unbiased way. Just last week, the U.N. Security Council took the nearly unprecedented step of condemning the murder of five Israelis — but refused to include the name of the Arab group that carried out the attack, even though the group, Islamic Jihad, actually took credit for the bloody murder. Similarly, England was host to a March 1 conference, ''The London Meeting on Supporting the Palestinian Authority,'' and even before the conference began the British had decided that the convention's final statement would not mention any obligation by a Palestinian government to prevent attacks on Israelis. The media are equally to blame, for they sketch an unbalanced portrait of events. One of the catalysts of the war carried on against Israel these past four years was the shooting of 12-year-old Mohammed al-Dura during a firefight between terrorists and Israeli soldiers in September of 2000. A French cameraman had shot video purporting to show that Israelis shot the boy in cold blood; the pictures were published worldwide, including in The Morning Call. The boy's death became a cause celebré. Both the French paper Le Figaro and The Atlantic Monthly belatedly concluded that the boy was shot by Arab terrorists, but other news outlets, including The Morning Call, have not reported the corrected story. To term this round of the Israeli-Arab peace process ''insane'' would be premature; there is time, yet, for improvement. But until we see a process between cooperative governments, with democratically involved populations, supported by an unbiased world, we are doomed to a repeat of Oslo's bloody disaster. I know there are populations around the world who love the United Nations - after all, who wouldn’t love an organization that pledges to work for peace, that feeds the hungry, that distributes medicine for the sick, that provides comfort for refugees? But the UN’s habit of beating up on Israel, or aiding those who beat up on Israel, is really wearing on any love I might feel for the world’s policeman. the bias is just absurd. The Human Rights Council has now passed 60 per cent of its resolutions on Israel alone and nothing, for example, on China and Zimbabwe and Saudi Arabia, according to human rights academic Professor Anne Bayefsky. This is why Israel and her supporters have a hard time taking seriously United Nations calls for the end of hostilities in Gaza. Yes, the UN does a lot of good in some corners of the globe - but their track record in the Middle East is abysmal. Democracy, including that democratic system which governs UN activity, is supported by two major forces: Votes and Money. Votes are needed to approve initiatives; Money is needed to carry out those initiatives. Since there are more than 20 Arab states, many of which are oil-rich, and there is only one Israel, which has no oil wealth, the UN’s every vote is automatically slanted toward that Arab bloc. The world is tired of the Middle East and its wars, and would love to have peace. Arab countries promise that if Israel were gone from the region, the Middle East would be at peace. Never mind that Iraq invaded Kuwait without any Israel issue, never mind that Syria controls Lebanon for reasons of greed rather than politics, never mind that Shiites and Sunnis continue to kill each other with or without Israel… the United Nations would love to try for this magic solution to their 60-year headache. This is simple fact. Fences, air raids, targeted killings of terrorists, checkpoints, and so on - these are ugly, they make for ugly photographs in the press, and they are easy fodder for anti-Israel propaganda. It’s hard for the world to stomach seeing this, even if they start out sympathetic to Israel’s cause. Dating back to Cold War US-USSR rivalries, the United States has long been Israel’s staunchest supporter, and Israel has returned the favor with political and military support. The love goes both ways. And with the United States as Public Enemy #2 in the United Nations, Israel suffers from guilt by association. Certainly, November 1947 was a remarkable moment in time, a moment when many nations united in support of the return of Jews to their historic land - but it was only a moment, and it was driven by motivations that had nothing to do with acceptance of the Jewish narrative. Guilt, greed and political alliances drove that vote, not a noble recognition that Jews deserve to be able to live in the land of their ancestors. The result is that when those original motivations (guilt, greed, alliances) disappear, and certainly when they apply instead to Arab causes, the support for Israel turns into antagonism against her. So I fully understand why the UN, an organization led largely by good people with good intentions, is committed to wiping Israel off the map. But please excuse me when I tell them what they can do with their good people and good intentions, their UNRWA and their Naqba and their resolutions. The fact that there is logic behind their anti-Israel bias doesn’t mean I’m going to listen to them. Message to the UN: Until you can see past your Arab bloc and your simplistic desire for easy answers, until you can put some effort into understanding Israel’s situations, until you can get past your anti-US stance and embrace Israel’s reason for existence, don’t call us. And, no, we won’t call you. Are you calling the Gazans murderers? Take a look at the places that they live in. Its mostly refugee camps. "Refugee camps." I love it. The Gazans live in "refugee camps," and therefore it's okay for them to rocket kindergartens and hospitals in Israel. d) They like being able to tell the world they are waiting to return to "their land" in the Ottoman Empire. Reading the above, I realize that some of it sounds harsh - but it’s also the truth. In 1957, the Refugee Conference at Homs, Syria, passed a resolution stating that "Any discussion aimed at a solution of the Palestine problem which will not be based on ensuring the refugees' right to annihilate Israel will be regarded as a desecration of the Arab people and an act of treason." The Arab League issued instructions barring the Arab states from granting citizenship to Palestinian Arab refugees (or their descendants) "to avoid dissolution of their identity and protect their right to return to their homeland". Iraqis kill them, Syria refuses to grant them citizenship and will not permit the ones fleeing from Iraq to enter, Kuwait has kicked them out, Egypt has kicked them out, Lebanon denies them citizenship and Jordan keeps more than one million of them in camps. Israel should have greater rachmanus than these Arab countries? Let the refugees fire rockets into Egypt! Second, they are too busy rocketing Israel to build homes on the land they do have. There is quite a bit of undeveloped land in Gaza. For that matter, when Israel left Gaza in 2005 they abandoned homes, towns, greenhouses and infrastructure. However, because the Palestinians chose to demolish and loot what was given to them, and because they have spent more time rocketing than reconstructing, we have these "refugees." Third, the UN has promised them plenty of cash, so long as they stay in these camps. The United Nations has a special branch dedicated to this purpose: United Nations Relief and Works Agency for Palestine Refugees in the Near East (UNRWA). This is a relief and human development agency, providing education, health care, social services and emergency aid to over four million Palestinian refugees living in Jordan, Lebanon and Syria, as well as in the West Bank and the Gaza Strip. So any resettlement and normalization of life results in the loss of UN benefits. Note, by the way: There is no dedicated agency for Jews who were exiled from Arab lands in 1948. And fourth, they like being able to tell the world they are waiting to return to "their land" in the Ottoman Empire. This, to me, speaks for itself. And there you have it - these are your refugees, and their refugee camps, and their justification for attacking Israel. In my pre-adolescent years, my outlook on Rabbis-and-Current-Events was shaped by my father’s dislike for speeches that spent more time on the New York Times than on the parshah. For a long time I actually assumed that this was a broadly held view; after all, why would anyone expect a rabbi to have special insight into the Falklands War, Afghanistan, the Iran Hostage Crisis or any of the other events that shaped my 70s and 80s upbringing? So much so that when I did my very first interview for a rabbinic position - a synagogue in Worcester, Massachusetts - and someone asked how often I would speak about current events, I said I would do it maybe once a month, if that much. This was not the answer my questioner was seeking; he, and others present, felt that in order for Torah to be relevant to their daily lives, the rabbi would have to speak about Yitzhak Rabin more often than he would speak about Rabbi Shlomo Yitzhaki, about modern Israel more than historical Eretz Yisrael. Relevance! That was actually a key moment for me, as I was taught what "relevance" means to so many Jews. Upon reflection, I grasped what he was saying (although I didn’t grasp the job…). It made sense; even if I wasn’t a brilliant economist or an expert on the Far East, my connecting Torah to the comments of those economists and experts would make shul, Torah, Judaism as a whole, more reachable for many people. In the years since that watershed evening, I have spent a great deal of time reading about topics of popular interest, from the European stock market to Central American history to the history of medical understanding of the circulatory system to quantum theory and Hadley cells and meteorology. Much of that has become useful in classes or newspaper columns or in direct conversation; some of it has simply made me a broader person. And yet, and yet - I have never quite shaken the feeling that rabbis are overstepping when they comment, whether in shul or in published articles or in interviews, on the events of the day. Lead tehillim, promote activism, but don't interpret the news. My father’s skepticism remains with me. And so last night, when Shabbos ended and I picked up a phone message from 69 News asking for me to do an interview on Gaza, I was reluctant to reply. Really - what am I going to say, that the viewer doesn’t already know? The analogy of Hamas rocket attacks on Israeli cities to rocket attacks on LA or Detroit has been cited everywhere. The viewers who don’t care to remember Disengagement aren’t going to remember it because I mention it. I feel foolish even blogging about it; go check out Jameel, his on-the-scene comments have much more relevance than mine. But, remembering that night in Worcester, I called the reporter back. As it turned out, though, I was too late; in the intervening hours since their Shabbos afternoon call, they had found another candidate. I expect I will draft an Op-Ed for the local paper, though. As Shemuel said to Shaul, "הלא אם קטן אתה בעיניך ראש שבטי ישראל אתה - Even if you are small in your own eyes, you are yet the head of the tribes of Israel." I am, to some people, a commnunity representative. So if someone out there takes my view seriously, then I am responsible to make it heard. Kassams, Air Strikes, Gaza Invasion, UN Resolutions, Withdrawal, Kassams... and then what? The problem is straightforward: We have to do something, but there's nothing to do. To sit on our hands while thugs bomb our cities is suicidal madness. Certainly, they lack the means to destroy our country. But the psychological toll on a population under threat is huge. They count on it – that's why they launch the kassams. Their goal is to make Israelis want to get out. Not out of Gaza, but out of Israel. So we need to do something... but what? Diplomacy is meaningless. You're talking to people whose declared goal is to eliminate you. Your goals run directly counter to theirs. So how can you gain their support for your vision? To borrow from Ury, how to Get to Yes? Threatening bluster is just that, bluster. It accomplishes nothing, the equivalent of a frustrated cry at a television screen or computer monitor. Sanctions do nothing, because the people running the show in Gaza are happy to let the people suffer. They enjoy it, knowing it brings headlines and international sympathy. And so we are left with military force, with airstrikes and a ground assault and a lot of burned out buildings and dead bodies and UN resolutions. Eventually, because this operation will run true to the same pattern we have seen every time before, because this Israeli government has no strategy, no goal, no benchmark of success or definition of victory, the troops will pull back. Hamas will launch a few missiles to show it still can, to save face, to declare triumphant victory. And the rockets will resume. And we'll be back where we started from. And who know where Gilad Schalit will be? "Bless this our country, the United States of America"
There is a near-universal practice, in traditional Orthodox synagogues, of blessing the local government and praying to Gd to provide it counsel and support. From East Asia to Russia to Europe to North and South America, in languages varied and with diverse texts, Jews call upon Gd to benefit the lands in which they live. (I'm not sure about Africa.) There are many motivations for this practice, including simple gratitude, a recognition that all citizens benefit from law and order, and a solicitous desire to demonstrate patriotism. The more jarring part of that opening line, for many, is the word our. If we term America “our country,” is that a demotion of Israel, and/or a rejection of the fundamental Jewish longing for the arrival of Mashiach and kibbutz galuyot, the ingathering of Jews to Israel? I've mulled and debated this question for the past seven-plus years, and overall I have made my peace with this dubious “our.” The word describes a relationship, yes, but not in an exclusive sense. In my view, our accurately describes both our relationship with Israel and our relationship with America. If "our" described ownership, I would reject this our; there is only one Jewish land. But, to my mind, “our” is less a statement of possession than a statement of loyalty and responsibility. Our families, our homes, our lives, our careers, our friends – these are ours which are less about owning than about being owned, more about fealty than about property. In this sense, both lands are “our” lands, for both lands may rightfully claim our hearts and our powers. Israel is “our” country in the sense that it is the only land which is truly attached to a Jew. It is the land in which our genetic and spiritual ancestors lived, loved, worshipped, were born, died and were buried. As we have been taught for millenia, it is the true locus for all that is Judaism, the theater where mitzvot have their greatest meaning as well as application, the earthly soil where a Jew can most fully connect to the Divine. Israel has been promised to us, and we have been promised to it; this land lodges a claim upon our lives as great and as permanent as our own claim upon its soil. But America is also “our” country, in the sense that it is the land which absorbed us, which afforded us the freedom to live as Jews when no other polity would do likewise; which came, over the course of centuries, to recognize Jews as worthy of education and position and political authority; which bucked the trend of human history and divested religion of government imprimatur and military enforcement; which provided social and economic support for the founding of some of the most vibrant Jewish communities and Torah yeshivot in the world. Certainly, my heart - and, one day soon, Gd-willing, my body - is in Israel. Certainly, the relationship between sectarian Jew and universalist United States, and between America and Israel, is perennially conflicted and inherently insecure. Certainly, not every government and governor has been as generous of heart toward the descendants of Avraham and Sarah. Indeed, I am penning this essay on a day when the vast majority of my neighbors celebrate the birth of a man whose ideology I declare anathema, and whose theological descendants have massacred millions of my kin over the past two thousand years. Still, for all of the reasons above, there is little doubt in my mind that America, even on the twenty-fifth of December, is “our” land. Well, my answer should probably be, “I can’t vacation well.” In fact, I suspect many rabbis have the same problem. Vacationing is important for anyone whose career demands 24-hour days and whose regular interactions involve matters of physical or emotional life and death. Surgeons, therapists, rabbis, we really do need to get away; if we don’t, we overload and burn out. I can always tell when burnout is coming: I start to feel nervous all the time, like there’s something I haven’t taken care of. I start to prepare for classes that I won’t give for two weeks. I’m in the middle of Shabbos morning and suddenly five different to-do items pop into my mind, items I know I’ll remember afterward and yet I keep mentally repeating them lest I forget them before Shabbos ends and I can write them down. I see people and immediately ask myself whether I haven’t congratulated them for an accomplishment or consoled them for a loss. So I know that vacationing is important. I tell other people to take vacations. I tell myself to take vacations. But I’m just bad at it. One day in, and I’m nervous about how things went in shul that morning. 36 hours in, and I’m thinking about the people in the hospital. Two days and I’m on the phone to aveilim (mourners). Our shul secretary laughs at me when I call in; she knows. One reason I’m so bad at it is that I worry about people. These are my people, and I want to make sure everything is all right for them. Another reason is that I worry about all the work building up for my return. Another reason is that I put on my rabbi outfit for Shacharis in the morning and then need to put it on again for Minchah, and changing in between is too much of a pain, so I end up in a tie all day. And a fourth reason is that being a rabbi has become so much of what I do, and so much of a justification for my existence, that I have a hard time seeing myself - justifying myself - as anything but a rabbi. Which is not healthy. And which is why I haven’t taken vacation time since last December (unless you count two days in New Jersey). And then I wonder why I may have prehypertension. So we’re going to my in-laws for a few days. I'm packing my mental list of people with whom I want to check in from the road. I'm packing a few sefarim to prepare a major shiur for mid-January. I’ll still post my daily Torah Thought and Jewish Law emails, because Torah cannot take a vacation. I’ll probably put up a couple of blog posts, too, since I find blogging more restful than not, actually. And I’ll enjoy having hours at a time to spend with the Rebbetzin and our Rebbekids. And, Gd-willing, I'll return prepared to tackle the world again. I recall that last year an environmentalist group destroyed a lot of paper and expended a great deal of computing power promoting the idea of lighting one fewer candle on Chanukah, or some similar idea. Regrettably, not only is Chanukah tough on the environment, but the demands of the modern American rabbinate are hard on the environment as well. I have been thinking this through carefully, and I have come to realize that if rabbis were able to relax some of the elements of our jobs, we could do a lot to preserve our environment. 1. Rabbis are called upon to deliver many classes in the evenings, after people return home from work. This requires a great deal of electrical power. Better for rabbis to stay home at night. Also, rabbis should schedule their weekday classes at times when fewer people can attend, to reduce the amount of driving which will take place as people come to the shiur. 2. Rabbis are expected to attend hospital bedsides and visit shivah homes, as well as participate in happy occasions. Much travel is involved in officiating at everything from a Vachnacht to a Hakamat Matzeivah (unveiling). Perhaps rabbis could just email out guides to special prayers for, and officiating at, religious events, and people could then run their events themselves. 4. Rabbis must be available every moment of every day, which requires great use of cell phones, Blackberrys, Treos, etc. This inevitably translates into a lot of charging time. Rabbis should make themselves available less, and thereby save electricity. 5. Since the days of the Talmud, rabbis have been expected to maintain a clean and orderly appearance, but today some congregants take that requirement to an extreme, catching every small spot and wrinkle. The result is great overuse of dry cleaning chemicals as well as a wasting of water. I would like to see this standard relaxed. 6. And, perhaps most important, rabbis need to recycle more. I propose that rabbis should be permitted - nay, encouraged! - to recycle speeches and divrei torah after allowing them a two-year composting period. I recognize that not all congregations and congregants value eco-rabbinics as I do, but I trust that, in the interest of our planet, we will be able to find common ground and save the planet, and our synagogues, for generations to come. I’ve been speaking publicly for twenty years or more. I started with divrei torah at my shul’s auxiliary minyan and shiurim when the shul of my childhood was without a rabbi. Since then I’ve been an NCSY advisor, a baal keriah/teacher in a Shabbos shul, a rabbinic intern who was given plenty of chances to speak, and, of course, a pulpit rabbi now in his twelfth year. I teach four to seven formal public classes per week, in addition to Daf Yomi, to groups of all kinds. I should be pretty comfortable with this speaking thing by now. 1) A lot has to do with familiarity of setting. Example: I am, unfortunately, pretty comfortable with funerals, thanks to my familiarity with them. 2) Some of it has to do with confidence in what I have to say; if I feel good about what I’ve prepared for a Shabbos morning speech, I tend to be less nervous. But then there are occasions when familiarity and confidence in my material are irrelevant. Divrei torah, committee reports, awards and installations… I officiated at a wedding yesterday and found myself incredibly nervous, even though I was among wonderful friends and ecstatic about having the chance to be mesader kiddushin. So why was I nervous? 3) I think I get nervous when I’m distracted, when I’m not focussing on what I am saying, when I’m not absorbed in the thought. On any given Shabbos morning, there are many subplots afoot in shul – visiting guests and relatives, political issues, taking care of my kids as they daven, people going through life changes – and those subplots tend to percolate in my mind as I am getting up to speak. The same is true on any occasion, from the simple to the sublime. At a meeting I might also be thinking about a class I’m developing; at a bar mitzvah, a thought about something that happened at minyan that morning might intrude into my mind. I just have a lot of thoughts vying for attention. It’s like living in shmoneh esreih, all the time. Many people are like this, I think, and particularly those who have grown up multi-tasking every moment of their lives. The result is that I am less “in the moment,” less focussed, less able to make an absorbing connection with my material. That may also be why I don’t get nervous when teaching a class – because I tend to prepare material that requires real thought, and I am forced to think carefully in order to explain it to the group. 3) And if it’s distraction – Take a minute to clear everything from my mind, before speaking. Simple, but it sounds like a plan. Is "Wish me luck, I'll need it" a winning Israeli political slogan? Ehud Barak wants to know: Do you feel lucky? Not long after launching an advertising blitz portraying Labor Party chairman Ehud Barak as neither trendy nor nice, but as a leader, the party unveiled the second phase of its election campaign on Thursday evening. The new effort features Labor's Knesset candidates, divided into clusters of four with Barak at the center of each, next to the popular Mediterranean phrase "Hamsa hamsa" (a local variant of "knock on wood"). "We have chosen to send the obvious message: We have the best team," Labor campaign manager Mordi Amar said Thursday. "'Hamsa hamsa' is commonly said about something that is good and works, when the subtext is 'don't jinx it,'" added Amar. Let's not talk around it - a hamsa is a good luck charm. I don't know. I'm trying to picture an ad campaign with Barack Obama holding a lucky rabbit's foot... or Joe Biden with a four leaf clover... or John McCain in a Vegas casino... or Sarah Palin with her fingers crossed... and it's just not doing it for me. "Vote for Barak - you might just get lucky." "A vote for Labor, and a hot pair of dice, will help you win big at the tables." "I won't change my lucky socks until Election Day." "It's better to be lucky than good, right?" Maybe this is just the logical message for people who see Ehud Barak "as a leader." Or maybe Labor really is flat out of ideas. If you would glance at my bio photograph, you would see a young, dynamic rabbi (that would be me) holding a baby (our second child). 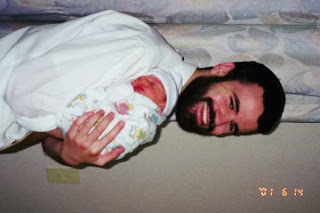 If you would look at the date on the scanned picture, you would see that it was June 14, 2001 – two days after that baby was born, and eight days after we moved to our new home, Allentown, Pennsylvania. But what you would likely not realize - unless you were ridiculously expert in the history of the Allentown Jewish Community - is that June 12, 2001, the evening that baby was born, was also the evening of the Jewish Federation of the Lehigh Valley’s gala closing meeting/party of 2001, and that as my wife was in labor, my cell phone (as well as our home phone) was ringing with calls asking why I wasn’t at that meeting. 1) A Federation’s closing meeting is its chance to honor people who have worked hard for the community all year, and so many of the community’s hard workers attend. Big chance to meet the people with whom I would be working. 2) My predecessor did a great job of integrating our shul and the Orthodox community into the Federation community, and everyone would be looking to see whether I would continue that effort. 3) The Federation folks had been told that I had just moved in, and expected to be able to publicly welcome me at the program. It would not do for me to pull a Joe the Plumber and miss my shout-out. (3) Even most of the people who understand that you had to miss their event will still feel bad about it. But, of course, I was busy that night, and so I missed the big closing meeting. It would not be the last time I would miss a community event for the sake of family, but it would definitely be among the most memorable. As Arnold Fine used to say, “I remember when…” In this case, I remember when I was young and dynamic. It was a Reform (liberal) synagogue and there I met a young and dynamic Rabbi who showed me that Judaism could be open, wonderful and loving. …and so on… Even the phrase “dynamic young rabbi” yields 206 results. And is theres any shul out there seeking a rabbi that doesn't put "seeking a young, dynamic rabbi" in their search description? I am only 36, and I’ll challenge anyone to find an aspect of our shul or community to which I don’t devote serious time and energy, but I don’t feel like “young and dynamic” makes sense as a description for me anymore. Maybe it’s because I have four kids. Maybe it’s because I am starting to get visible silver on my temples. Maybe it’s because I’m no longer in the “young” set at the gym. Maybe it’s because doctors no longer say, “I’ve never seen such a young rabbi” when I visit their hospital patients. Maybe it’s because I’ve been a rabbinic mentor for three years now. To quote the folks at the Mayo Clinic, Prehypertension is a systolic pressure from 120 to 139 millimeters of mercury (mm Hg) or a diastolic pressure from 80 to 89 mm Hg. In truth, it could be that I scored high because I get anxious about having people stick long needles into my veins. Or it could be a blip from Shabbos food. Or it could be from my anticipation of a day that included running storytime programs for toddlers, teaching a class, being on basketball duty for the kids, preparing two classes and attending our shul Chanukah concert. But my prehypertension is making me tense. Still: They can take away the “young” from me, but they can’t rob me of “dynamic.” I wonder whether any shuls look for "old and dynamic rabbis." I visit Jewish inmates at local prisons; I’m glad to say there aren’t too many, but there are some. I was once visiting an embezzler who had been a salesman, and had stolen his customers’ fees to support his gambling habit. He explained to me how he had fallen into doing it: In the beginning, he had been able to sign up enough new business, and win enough at the tables, to pay back the company before anything was noticed. Other salesmen and even managers knew about it, but they let it go because he was such a good salesman. And every month that he made it through reinforced the idea that he could get away with it - in fact, that nothing was wrong. He could never bring himself to stop believing that the next day would bring salvation, that the next gamble would win back everything he had lost, and so he never came clean - until he was arrested. I wouldn’t know Bernard Madoff from anyone, and every person has his own motivations and complexities, but I can easily envision his scheme starting in much the same way, even without a gambling habit: Investments one quarter don’t meet the expected returns, and he worries about his record and his appeal for new clients - so he takes some of the new money coming in, and uses it to inflate the portfolios of existing clients. It's more about reputation than building wealth. Madoff develops a great reputation for successful investment, everyone wants in, so he needs to keep the reputation up, needs to provide great returns. It’s easy, just take the incoming money and spread it among other portfolios, all the while pretending that the new portfolios are also doing well. Works like a charm, so long as more new money is coming in than you need to spread around the old accounts. And every quarter that he makes it through reinforces the idea that he can get away with it - in fact, that nothing is wrong. Once things turn, though, you’re toast, and it doesn’t take long - maybe one quarter, maybe two - before you’re in too deep to ever climb out. Until, like my inmate friend, you are arrested. I don’t see a “moral of the story” from the investors’ loss - they all invested in a fund with a great reputation, which had been entirely okayed by the SEC. You can't say, "They should have known it was too good to be true" - that's nonsense, they could not have known. But I do see a moral in Madoff’s story: Don’t start down an unethical path, because, sooner, or later, you end up on the front page for all the wrong reasons, and you’ll bring down a whole lot of innocent people with you. But you’re supposed to be a good guy/girl, and so you’re supposed to assume the best about me – this is the mandate of הוי דן את כל האדם לכף זכות, Judge everyone favorably. The two obligations are contradictory; either I should be able to do what I want and rely on you assuming the best about me, or I should be restricted to behavior which is clearly good and you should be able to assume that what you see is what you get! This issue comes up on Chanukah, regarding the halachah of a home with multiple entrances facing different directions. The question is the same: Why don’t we tell the on-looker to assume the best about me? Why do I need to worry about his sinful assumption of wrongdoing? Rav Menashe Klein, in his Mishneh Halachos (5:95) points to the fact that the gemara (Yerushalmi Shekalim 3:2, if I remember correctly), in discussing the law of avoiding suspicion, quotes an additional pasuk as the basis for requiring me to act in clearly positive ways: ומצא חן ושכל טוב בעיני אלקים ואדם, You shall find favor in the eyes of Gd and Man. This is a more proactive commandment, summoning the Jew to behavior which will earn him credit in the eyes of others, rather than require them to seek out justifications for his behavior. We are obligated to be our best selves in our own eyes, in the Eyes of Gd, and in the eyes of our fellow Jews. To me, this is a beautiful idea, for it is only upon the basis of a proactive philosophy that we will create a truly unified people. *Note: Those of us who live in cold/windy climates, as well as those of us who live in areas where a Jew lighting a menorah is in danger, light indoors. Therefore, the Shulchan Aruch says that in our times, anyone who sees a menorah-less side of the house will just assume we lit inside, and there is no obligation to light in two different spots. *Recognize that the film does have an agenda, and portrays reality through a lens; it cuts off the interviewed rabbis, and doesn't give us any real insight into the relatives, particularly those accused of shunning, at all. I didn’t even enter the room to watch the film; I stayed in the next room, preparing a gemara shiur while semi-listening to the familiar voices of gay men and women telling their stories. But as I was semi-listening, I did have a thought crystallize for me. I knew it on some level before, I’ve certainly applied it before, but I never really understood it as clearly as I did tonight: That this issue of homosexuality in the Orthodox community is really much more a matter of sociology and community than it is a matter of religion. The voices of outraged people, pained people, isolated people, sad people, resigned people, emancipated people, are not unique to this situation. This particular crisis is more intense and painful and intractable than others, but, fundamentally, their voices sound just like the voices of people disinherited by family and community for a whole host of reasons - religion, economics, personality, whatever. I’ve heard these voices in my office, on the telephone, at kiddush at shul, from homosexual and heterosexual, from teenager and senior citizen, from Jew and non-Jew; these are the voices of people who are dealing with years, lifetimes, of self-doubt and emotional pain, because they have been told by people they love and respect that they are defective. Therefore: The comfort we can offer people by telling them, “We don’t think you’re evil,” and “Of course we’re your friends,” matters a great deal, even if we cannot provide the heter (leniency) so many seek. Far more important than validation as a gay Jew is validation as a Jew and human being altogether. I am convinced that the damage wrought by telling a vulnerable adolescent he/she is immoral, evil or deviant is far worse than allowing him/her to remain gay. Which is something, I think, that we in the Torah-observant community can and must do more often. The City Clerk of the City of New York has a sense of humor. Who knew? If you are a clergy member or minister of any religious faith or a Leader of the Society for Ethical Culture, there are three registration procedure options depending on which most suits your organization or congregation. Option 1: Your denomination publishes a directory. If your name is not yet listed in a directory, you may also submit a certificate or letter that shows you graduated from the seminary or theological school of the denomination that publishes the directory. Option 2: Your denomination does not publish a directory, but issues Certificates of Ordination or Licenses to Minister. A statement that lists the location of the church, the reason for the church's founding, the number of trustees of the church, the approximate size of the congregation, and how often the congregation meets. Option 3: Your denomination does not publish a directory and does not issue Certificates of Ordination or Licenses to Minister. A statement that lists the location of the church, the reason for the church's founding, the number of trustees of the church, the approximate size of the congregation and how often the congregation meets. Once you have completed the form using the correct option above, you must visit the Manhattan office to complete your registration if you are a resident of the City of New York. If you reside outside of the City of New York you may mail the signed and notarized application, a photocopy of your proper identification and your fee of $15 by credit card or money order payable to the City Clerk. Turns out the City Clerk does have a sense of humor… who knew? I prepared this document for families anticipating a wedding, and decided to share it here in the hope that you would comment with any thoughts on ways to improve it. This is not intended to be comprehensive; it is a bare-bones introduction, although it is written to be intelligible for any audience. What Happens at a traditional Jewish Wedding? 1) I mention “parents” several times in the following document, but sometimes circumstances demand that it be a surrogate. I don’t mention surrogates each time in the document, for the sake of brevity, but surrogates are fine. 2) I mention “witnesses” several times in the following document. In Jewish law, a “witness” is an adult Jewish male who observes mitzvot and is not a close relation of the parties involved. The kallah (bride), along with her mother and the mother of the chatan (groom), greet guests in a specially designated room. The chatan (groom) stays in another room, with his father and with the father of the kallah. This room is usually called “the chatan’s tish,” meaning “the groom’s table.” Sometimes the chatan presents a small speech, and sometimes the friends of the chatan sing songs of celebration. There is food in both rooms, but the kallah and chatan do not eat. Historically, the families of the chatan and kallah would undertake various financial obligations for the wedding and for the couple’s needs. In order to ensure that there were no unresolved financial issues, some time before the wedding the two families would get together, and the father of the chatan and the father of the kallah would confirm before witnesses that there were no outstanding claims. The witnesses would sign a document, “Tenaim,” which would certify that they had seen this confirmation (tenaim = conditions). Today, most Jews sign this document at the chatan’s tish rather than beforehand; the father’s agree to the Tenaim in front of two witnesses, and the witnesses sign the document. The mothers of the chatan and kallah generally come in for this as well, and when the Tenaim are complete, they break a plate together. This is meant to indicate that just as a broken plate cannot be reassembled, so one’s word, once broken, cannot be made whole. Jewish law requires that a husband accept certain responsibilities for his wife’s care, and that he guarantee a sum of money for her in the event of, Gd-forbid, divorce or his death. These responsibilites and guarantees are recorded in a document called a Ketubah (ketubah = written). We complete the Ketubah at the chatan’s tish; the chatan agrees to all of the responsibilities recorded therein, in front of witnesses who then sign the document. The Ketubah will be brought to the chuppah when the chatan and kallah go there later. Depending on the timing, there may be a minyan for minchah at the chatan’s tish before or after the ketubah is completed. Traditionally, the chatan and kallah do not see each other for a week before the wedding; the first time they meet is after the completion of the ketubah, at the bedecken. Various sources are brought to explain why we have a bedecken at all, and even what the word bedecken means, but this is what happens: The chatan is escorted by family and friends into the kallah’s room, generally with a lot of music and fanfare. When the chatan arrives at the kallah’s chair, the kallah’s father offers her a blessing. This is usually the blessing Rebecca’s family gave her before she went to marry Isaac (Genesis 24:60) and the blessing of the kohanim (Numbers 6:24-26). In some families the kallah’s father puts his hands on her head while offering this blessing. Sometimes the mother of the kallah, and/or the parents of the chatan, may offer a blessing as well, and sometimes the rabbi does so, too. The chatan then leaves the room, again with music and fanfare. The guests enter the chuppah room, and the families prepare for the chuppah. Some have the custom of placing a little bit of ash on the chatan’s head before the chuppah, as a way to recall the destruction of the Beit haMikdash (Temple in Jerusalem). The ash is on top of his head, and not visible to others. The chatan arrives under the chuppah, usually escorted by his parents. He puts on a kittel and/or tallit under the chuppah, depending on family custom. Someone sings a song, “Mi adir,” when the chatan arrives. The kallah arrives under the chuppah; in some families the chatan comes out to welcome her. The chatan and kallah then stand facing toward Israel, with the kallah on the right and the chatan on the left. The rabbi, and two designated witnesses, stand facing them. A cup of wine is filled. The rabbi recites two blessings on the wine, one for the wine and one for kiddushin, the initiation of marriage. The chatan and kallah answer Amen, and each drinks some of the wine. In front of witnesses, the chatan produces a ring, shows it to the kallah, certifies that it is his own, recites the words “Harei at mekudeshet li bitaba’at zu k’dat Moshe v’Yisrael (Behold, you are betrothed to me with this ring, in accordance with the laws of Moses and Israel),” and places it on the kallah’s index (not ring) finger. At this point, in some weddings, the rabbi or a guest present a brief speech. Also at this point, in some weddings, someone reads the ketubah aloud. The chatan then hands the ketubah to the kallah, in front of witnesses. The kallah generally then gives it to someone to store safely for her until after the wedding. The kallah must always, throughout her marriage, know where the ketubah is; if it is lost, a rabbi should immediately write a new document, called a ketubah d’irkisa (“ketubah that was lost”), for her. A second cup of wine is filled. Seven blessings are recited, sometimes by the rabbi and sometimes by guests. The person reciting the blessing holds the cup of wine. The chatan and kallah drink from the cup. The chatan stamps on a glass, breaking it, to remind us of the destruction of the Beit haMikdash. The assembled sing “Im eshkacheich,” a passage from Psalms about remembering Jerusalem. The guests then dance the chatan and kallah out of the room, to a specially designated room known as the “Yichud room” (yichud = isolation). Some Jewish legal scholars have argued that the actual moment of marriage takes place when the chatan and kallah are first secluded together; the purpose the Yichud room is to give them that seclusion. The rabbi and two witnesses inspect the room to ensure that no one is inside, and no one could get in from any means other than the main door. The chatan and kallah enter the room alone and close the door, and the witnesses stand by the closed door to ensure that no one enters for at least ten minutes. After that the witnesses depart, and the chatan and kallah may emerge when they choose. What's the first thing to teach children about Judaism? I have the pleasure of helping young men prepare for bar mitzvah, generally by teaching them how to lein (read from the Torah) and, sometimes, lead davening. I also get to work with them in preparing a dvar torah, and I take the opportunity to train them in various Jewish ideals and in practical Jewish life as well. The experience is generally a combination of pedagogy, amusement and frustration (and that’s just in dealing with the parents!). My task is a convergence of passing along new information, conveying high expectations without burdening them with stress, and helping them succeed even as they handle everything that comes with the onslaught of adolescence. Generally, the kids come in with some level of background; whether they’ve been to day school or supplementary Hebrew school, they have some awareness of Jewish concepts, at the least. Once, though, I had a truly different experience: An unaffiliated family came to me with a child who had no Jewish knowledge. We’re talking blank slate, tabula rasa, didn’t know who Avraham and Sarah were, didn’t know who Moshe was or what Mount Sinai was. No – he did know what Israel is, in the sense that it’s a country with a lot of Jews living there. But beyond that, nothing. So what do you teach a 12 year old boy about Judaism, as his introduction to the whole thing? The very first thing? Do you teach him Shma, do you talk about Gd and monotheism? Do you teach him תורה צוה לנו משה, that HaShem gave us a Torah of ritual mitzvos and social mitzvos, which is the anchor of everything Jewish? Do you teach him about Divine reward and punishment, Gan Eden (heaven) and Gehennom (hell) and what we believe about theodicy, about bad things happening to good people? Do you teach him about Jewish history, our ancestors and the kings and the Beis haMikdash and the exiles? Do you teach him how to live daily life as a Jew – kashrut, Shabbat, holidays? Do you teach him how to daven? The possibilities are endless; ארוכה מארץ מדה ורחבה מני ים (its measure is longer than the earth and broader than the sea)! I settled on Motivation as the first focus. For a 12 year old boy raised without any exposure to Judaism and then suddenly thrust into Bar Mitzvah training, the biggest question must be WHY – why do my parents think this is important to me? Why, when I am on the verge of adulthood, when I could be out playing basketball or listening to music or playing with my Nintendo or just relaxing, when I have all of these school pressures and social pressures, do I have to spend 45 minutes a week with a rabbi? We’ve never cared about this before! So I thought he needed to learn Motivation – why any of this matters, to him. And so I started not with any of the above, but with a list of 20th and 21st century Jewish accomplishments. You know, like those chain emails that go around about Jews who invented the cell phone and got Nobel prizes, et cetera. Broader than that, though – I included survival in the Holocaust as well as the founding of a country and its defense against numerous invasions. I included the ways in which modern legal systems trace themselvs to the Torah’s laws. I included pioneering Jewish leaders from many different areas of thought and life. And then we were ready to get started. I’ll tell you this – it worked so well that this is now the first thing I do with all Bar Mitzvah kids, including the ones trained in Yeshiva. What would you have done? What’s the first thing you would teach a Jew about Judaism? I loved living in Rhode Island. Where others might have been embarrassed by the corruption of our municipal and state governments, I was more-or-less amused by it. I moved out of Rhode Island in June 2001. In July 2001 we paid what we thought was the last of our vehicle tax bill, and never heard anything further about a vehicle tax. Turns out, Rhode Island bills you for your vehicle tax at the end of the year. Therefore: When we paid in July 2001, we were paying for the use of our car in the year 2000. We were not billed for 2001 until July 2002 – but by that time we were no longer at our old address. Even if the state did send a bill, it would not have been forwarded to us. Okay, fine, that's an honest error and it results in a bill. Rhode Island continues to keep you on the registry rolls until (a) you return your plates, or (b) your registration formally expires, even if you register your car in another state. Therefore: Not only did they bill us in absentia for 2001 – they also billed us in absentia for 2002, for a car that was actually registered, for all of 2002, in Pennsylvania! And, of course, we never actually received any bill, since they didn't bother to use the new address they had on file to send us anything. So we owed that vehicle tax, but didn’t know it. Fine. That much I could accept, and understand that I was in error, and ignorance is no defense and all that. The state never made any attempt to follow up, until more than five years later, when they hired a collection agency, the Rossi Law firm, in January of 2008, to pursue tax delinquents. So we received a letter out of the blue yesterday, notifying us that we owe $430 – an original $250 or so for our tax, plus almost $180 in interest. (e) Failure by the tax collector to send, or by the taxpayer to receive, a bill shall not excuse the nonpayment of the tax or affect its validity or any proceedings for the collection. That's right: They can wait as long as they like, 5 years or 10 or 15 or 20, make no attempt to find you, and then send you a bill when the interest hits an amount they like. This is what bothers me – the original bill, I can deal with. But charging interest on a debt, when you never made a good faith effort to notify the debtor of the debt, is just wrong. So let your Rhode Island friends know: If they ever leave the state, they had better contact the DMV and make sure they know what they owe, and what they need to do. Otherwise, they should be prepared to pay up later, with interest. I joined Facebook the other day, more or less because everyone else was on it and I wasn't. It was embarrassing; I had one of the first Torah websites with Webshas(http://pages.nyu.edu/~mat6263) back in 1995, and here I was, behind the times. So I decided to catch up. Facebook immediately offered to email close to 300 email contacts of mine and offer them the unique opportunity to be my friend. I whittled down the list to about one-third of that, by removing those for recipients whom the request would be embarrassing as well as those for whom I would be embarrassed to make the request, and then let the requests fly. Less then 36 hours later, I am the proud friend of about 50 people, and feeling pretty good about that. I don’t really plan to use Facebook much, but I did notice that a lot of people post a picture of themselves on their page. It becomes an icon for them, much like the pictures people post on Blogger. I don’t know what to do with that. I'd like to think I was above vanity, but even if I were - rabbis get judged for their appearances all the time, and I'm a rabbi, so I need to weigh that issue. 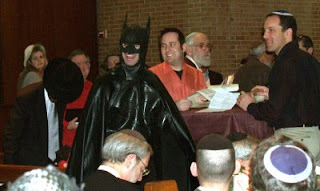 Don't think rabbinic appearances matter? First, the gemara says they do; a talmid chacham who has dirty clothing is "liable for his life." And second, my own experience bears that out. It's hard for me to listen to someone who doesn't take his appearance seriously. And I know congregants (of other synagogues, of course!) who are critical of their rabbi's appearance. So what do I put on Facebook? I’d like to leave it blank, but that’s so… fuddy-duddy. Ditto for having a formal picture; way too pretentious. No frowning, for sure. But then, funny rabbinic pictures also feel fake to me. Who do you think you are, rabbi? Everyone knows you’re a rabbi, and rabbis are no fun at all. And, unfortunately, a cartoon doodle is a copout. 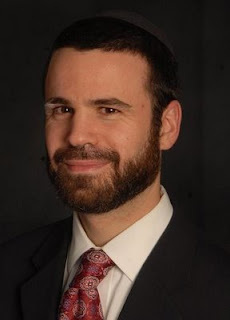 Should I go bearded, since as a rabbi I feel pretty much confined to bearddom? Or how about a beardless picture from a Purim-past? 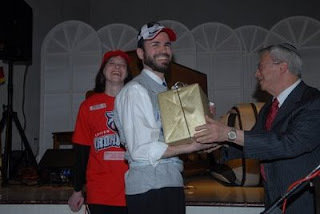 Or maybe I could use one from last Purim, when I dressed up as a member of our local AAA baseball team, the Lehigh Valley Iron Pigs (I kid you not – but I was fully under hashgachah, as you can see below)? And then there’s the competition between my vanity and my vitiligo. I was diagnosed with vitiligo a few years back (yes, me and Michael Jackson), and now have a partially-white eyebrow, and an inconvenient white spot on my moustache. (If I had a nickel for every time someone “discreetly” hinted that I need a tissue…) So do I go with a pre- or post-vitiligo picture? This is one of those thoughts that are patently obvious, but I’d like to put it in writing anyway, if only to remind myself when I read it again at some point in the future. Cyrgalis wants us to remember our goal: We may be angry, but we ultimately want to win, so let’s find a way to win. Of course, Cyrgalis’s logical advice is not applicable to many sports fans - because sports fans aren’t necessarily rooting for their team to win. Many sports fans are looking for catharsis, and they’ll take it any way they can get it, whether with a victory or a brawl or an outraged outburst at ref, coach or player. For many fans, it’s not whether you win or lose - it’s how you feel after the game. On the other hand, his advice makes a lot of sense for the rest of us, outside the arena, and particularly for a rabbi: If you act to serve your anger instead of your goals, you lose. *Rabbis are, in our own minds, on the “right” side. We are trying to run a shul and community, to help people fulfill mitzvot, to counsel people, and so on; clearly, we are the good guys. So if someone knocks us, it’s easy for us to be filled with righteous anger. *When you’re in the rabbinate, so much of your job is personal. You spend 15-20 hours each day worrying about people, working with people, helping people. The result can be a loss of perspective, and individuals’ insufficiencies - failure to come to minyan, coming late to a meeting, not working on a project - can come to look like a personal attack. *We keep very tight schedules, which don’t offer a lot of time for reflection. This is, in my experience, one of the most destructive elements of the modern rabbinate; scheduling the day in fifteen minute increments means that we don’t take the needed time to reflect before reacting. One way to deal with this is to keep the goal in mind, always. If you want her to work on the project, if you want him to come to minyan, if you want meetings to run well, getting angry won’t help the situation. Yes, you’re on the right side. Yes, it’s often personal. Yes, you need to move on to the next activity. But breathe, think, breathe, think, breathe, then act. It works. We can learn many lessons from what happened in Mumbai last week - lessons of security, lessons of politics, lessons of what it means to be identifiably Jewish in a country facing Muslim terrorism. Most of these lessons are negative - but in the funerals for Rabbi Gavi and Rivkie Holzberg in Israel I did find one positive message. As Yossi Klein Halevi pointed out, the Holzbergs’ bodies were returned to Israel along with the body of Rabbi Aryeh Leibush Teitelbaum, a Toldos Avraham Yitzchak chasid. All of them were killed while performing mitzvot in Mumbai - the Holzbergs running outreach services, Teitelbaum certifying kosher food production. All of them left behind orphan children. All of them were what Israelis would call chareidi; none of them would term the religious practice of your average secular Israeli “Judaism.” None of them served in the army. And yet the Holzbergs were mourned by the entire country, and their funeral was a national event attended even by Shimon Peres - where Rabbi Teitelbaum’s funeral was much quieter, the passing of this father of eight children much less noticed. Yossi Klein Halevi argues, and I have to agree, that one of the main reasons the Holzbergs were so widely mourned is the fact that they made a career of inviting in the secular Israeli. They didn’t just welcome people in; they went out and invited them in. Inviting is about more than just welcoming. • Welcoming is saying “Good shabbos.” Inviting is running outside to greet someone. • Welcoming is saying, “Call me if you want to talk.” Inviting is calling people up to see how they are doing. Inviting is the trait of an Avraham, who sees three guests and וירא וירץ לקראתם מפתח האהל, he ran to greet them from the entrance of the tent. Inviting is the trait of R’ Yochanan ben Zakkai, who always made sure to greet others first. R’ Yochanan ben Zakkai was known for never wasting a minute - but this was worthy of his time. And Inviting is a trait we learn from HaShem, who came out to greet us at Har Sinai, not waiting for us to come out of our tents first. This is one reason why the Holzbergs were so embraced; inviting is what many representatives of Chabad do, around the world. Whether holding a Seder in India or Thailand, or offering tefillin on a street corner in Tel Aviv, or distributing jelly doughnuts at the IDF front lines, shluchim are visible to the average Israeli, they approach the average Israeli, and the unconditional warmth of that approach is the appeal. Certainly, the shaliach doesn’t know anything about this particular Jew in front of him. Certainly, the shaliach expects something from the Jew he approaches. Certainly, elements of the shaliach’s philosophy are alien to, and possibly even offensive to, the Jew he approaches. But all of those certainties are irrelevant; what the Jew remembers is the warm, outgoing welcome he received in India, on the street corner, at the front lines. Human beings, as a rule, react positively to being invited in, even by someone with whom we have nothing in common. Look at Lavan’s meeting with Yaakov in this morning’s parshah. Yaakov flees home, he’s alone and he’s broke and he’s scared. He travels to Charan and arrives at a well, he talks to the shepherds, who are not particularly friendly. He meets Rachel and falls for her, she runs home to her father Lavan - and וירץ לקראתו, Lavan runs out to greet Yaakov. ויחבק לו, Lavan hugs him. וינשק לו, Lavan kisses him. ויביאהו אל ביתו, Lavan brings Yaakov into his home. Yes, the midrash cynically points out that perhaps Lavan had an ulterior motive, to get at the wealth he imagines Yaakov has brought. But you had better believe that Yaakov, himself, remembers that greeting. That’s a welcome! This is not merely an academic lesson about Lavan and Yaakov, or about the Holzbergs; it is an ideal, a model for us to imitate and practice. Not so that people will say nice things about us too, but so that we will fulfill our most basic mission as Jews. The most basic mission of the Jew, expressed and reiterated repeatedly in our Torah through story and statute and liturgy, is לתקן עולם במלכות שקי, וכל בני בשר יקראו בשמך, to repair the world in the kingdom of HaShem, so that all flesh will call in Gd’s Name. On Rosh haShanah and Yom Kippur we express an altruistic longing for the day when ויטו שכם אחד לעבדך, when all humanity will bend their shoulders as one to serve Gd. This optimistic prediction is not simply that every individual will serve Gd - it is founded upon the concept of שכם אחד, of individuals locking arms and embracing, to serve Gd together. Hence our great emphasis on מצוות בין אדם לחבירו, social mitzvot which bond people together. If all of us were to perform mitzvot individually, were to serve Gd privately, were to develop our spirituality and righteousness in a solipsistic vacuum, then that is precisely the way mashiach would come - with each group exultant in its own domain, each group adoring Gd in its own world, the globe an outsized Meah Shearim dotted by little enclaves representing every little shtiebel and shtetl. Our sages were most afraid of that all-too-possible possibility; witness the laws they enacted regarding arenas as varied as the פרה אדומה, the red heifer, and the celebration of Yamim Tovim, laws instituted in order to prevent people from bringing their own red heifers, in order to ensure that every Jew could mingle with, and dine with, every other Jew on Yom Tov. This is the world for which we long. We seek not to create a world in which every chassidic group and every yeshiva and every synagogue travels in its own social circle and is loathe to mix with the others, but rather a world in which the entirety of Jewry serves Gd in harmonious tandem. If we will bond with others, if we will invite in others, then we will become שכם אחד, one group. Not only לעבדך, serving Gd, but שכם אחד, doing it together. Sons of Israel is, by reputation and by action, a welcoming shul. We smile and say good shabbos to everyone who walks in. Our flyers all say, “Open to the public.” We have never turned anyone away by reason of ideology or lifestyle; Jews of all kinds can daven here, and they do. But, again, being “welcoming” is insufficient; we must find ways to be inviting - as a shul, but, more importantly, as a community. Whether that means calling up a friend and asking if she wants to come to a program, or stopping in at a neighbor just to talk, or inviting a new person to join a book club or card game, the bottom line is this: our goal as Jews is to be unified in the service of HaShem, and so we should take a page out of Lavan’s playbook: וירץ לקראתו ויביאהו אל ביתו, he ran to greet Yaakov and he brought Yaakov into his home. It’s up to us to do the same. 1. The Halevy article in The New Republic is available, at least for now, here. 2. R' Yochanan ben Zakkai is credited with greeting everyone first on Berachos 17a, and Succah 28a is where he is described as not wasting a moment. Chagigah 22a is the gemara on the red heifer, and 26a is on the measures of unity for Yom Tov. 3. We could also add a discussion of the Rambam, Hilchos Teshuvah 3:1, on one who is poreish min hatzibbur, separating from the community, by performing mitzvot alone. 4. My point is not to provide a commercial for Chabad, but rather to provide motivation for others. Perhaps I have produced both.